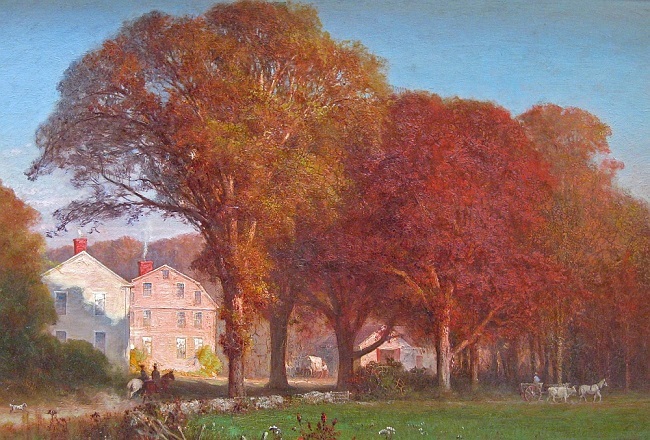 Wayside Inn (1870), Thomas Hill, oil on canvas. Image courtesy of the Skinner Auctioneers website. [I] looked in the record of town votes, supposing the town gave a bounty for killing certain birds and animals, but I did not find any vote. One thing I know by actual knowledge. When I was young, say fourteen years, the men in the northern part of the town did yearly, in the spring, choose two leaders and then the two sides formed. Their rules were: The side that got beaten should pay the bills. Their special game was the hawk, the owl, the crow, the blackbird, and any other bird considered to be mischievous in pulling up corn and the like. The poem is founded on fact. Killingworth is a farming town, on Long Island Sound, in the State of Connecticut. Some years ago there was an animated debate in the State Legislature, and the birds were doomed, as stated in the poem. 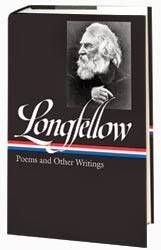 Of course, the details of the poem are my own invention, but it has substantial foundation of fact. Notes: The Saxon Cædmon, mentioned in the first stanza, is the earliest English poet known by name; he flourished in the seventh century. The reference to St. Bartholomew on page 445 is to the Saint Bartholomew’s Day Massacre in 1572, which resulted in the deaths of thousands of French Huguenots in Paris and elsewhere.